The massive storm that started out as Hurricane Sandy slammed into the East Coast and morphed into a huge and problematic system, killing at least 100 people in the United States. Power outages now stand at nearly a million homes and businesses, down from a peak of 8.5 million. Now, fears of a new storm coming on Wednesday, expected to bring gusts of up to 55 miles per hour, are rising. The storm is projected to pass within 50 to 100 miles of the N.J. coast. Flooding could potentially be catastrophic, especially in the areas where the coastline was eroded by superstorm Sandy. Many homes are still without heat and power, and any freezing rain or snow could make the situation much worse than it already is. Here's a snapshot of what is happening, state by state. Connecticut's two major utilities have kept their promise to restore power to more than 95 percent of their customers, but nearly 10,000 residents and businesses are still without power more than a week after Superstorm Sandy pounded the Northeast. In Old Lyme, Conn., building and health departments have designated about 210 houses as uninhabitable following inspections. Building Official Ron Rose said furnaces and wires were under water in some houses. Even after water recedes, he says electrical panels can remain wet. Officials say that homeowners may not have electricity restored until their houses are inspected by an electrician. Election Day turnout has been heavy, with many voters in areas damaged by Sandy expressing relief and even elation at being able to vote at all. Lines were long in Point Pleasant, N.J., where residents from the Jersey Shore communities of Point Pleasant Beach and Mantoloking had to cast their ballots because of damage in their hometowns. New Jersey Division of Elections spokesman Ernie Landante said the state had taken extra steps to make sure people displaced by Sandy's destruction would be able to vote, like allowing "authorized messengers" to pick up as many mail-in ballots as they request for people in shelters or away from their homes, and allowing displaced residents to cast ballots via email or fax. An odd-even rationing system for gasoline continued in New Jersey. Power outages remain high, at 556,000 customers, down from a peak of 2.76 million. At a press briefing Gov. Christie said 500 buses were being added to service Tuesday. He also said train service into Manhattan has been limited because of power problems on Amtrak's tracks. Details are available at www.njtransit.com. Limited PATH train service between New Jersey and Manhattan began Tuesday morning. Because so many voters were displaced by the storm, New York Gov. Andrew Cuomo issued an executive order allowing people to vote in Tuesday's statewide and presidential elections at any polling place in the state. New Jersey had already taken similar measures. At a press conference late Monday Gov. Cuomo slammed the state's utility companies for what he called their poor performance in restoring power and their failure to communicate with consumers. About 431,000 customers remain without electricity statewide Tuesday, down from a peak of about 2.2 million. Cuomo said such slow progress was "unacceptable," and that utilities will be held accountable for their performance, with the state's remedies ranging from sanctions to revoking a utility's franchise, reminding power companies that they're not "God-given monopolies." In New York City more subway service returned in time for Tuesday's rush hour, and limited PATH train service between New Jersey and Manhattan has resumed. The signal system on the G train still needs repairs, and the L tunnel is still being pumped out. And in Lower Manhattan the 9/11 memorial is reopening to the public a week after Superstorm Sandy flooded the World Trade Center site as it roared into New York. However, because of a nor'easter expected to bring high winds and storm surges into the area on Wednesday, Mayor Michael Bloomberg ordered all city parks, playgrounds and beaches to be closed beginning noon Wednesday as a safety precaution. Deaths: 47, including 40 in New York City. The government is suspending foreclosures in Rhode Island on some federally insured mortgages because of Superstorm Sandy, the latest state to receive a 90-day moratorium. The Federal Housing Administration has already suspended foreclosures in New Jersey, New York and Connecticut. The FHA, which is part of the Department of Housing and Urban Development, insures mortgages for low- and middle-income borrowers. Shellfish harvesters in Rhode Island are being allowed back into areas that had been off-limits after the storm surge and coastal flooding from Sandy negatively impacted water quality in several coastal ponds. The state's Department of Environmental Management says that starting at sunrise Tuesday harvesters would be allowed back into shellfishing areas in Quonochontaug Pond and portions of Winnapaug Pond and Ninigret Pond in Westerly and Charlestown. Several other shellfishing areas in the state remain closed, with water quality tests are ongoing. Deaths: None. Power outages: none, down from more than 122,000. 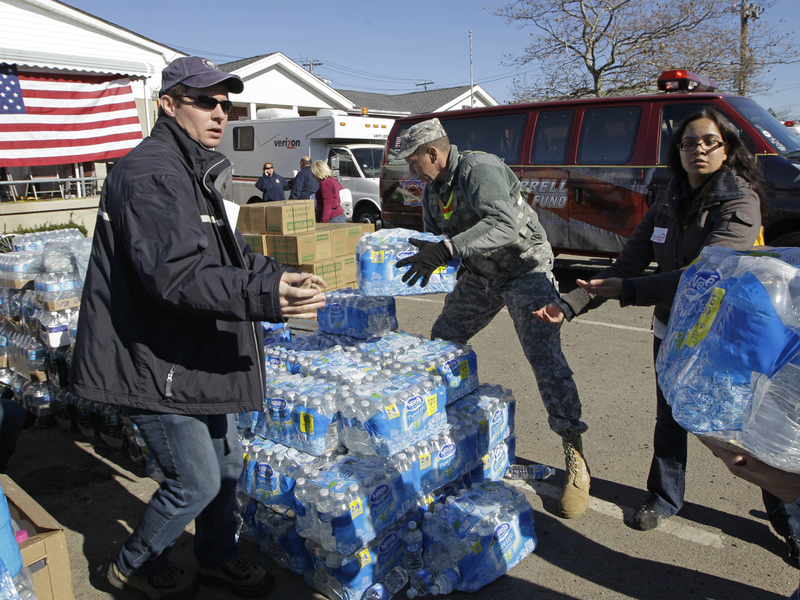 The Secretary of State's Office moved five precincts in three counties hard hit last week Sandy. More changes could come before Election Day on Tuesday. Details can be found online at www.sos.wv.gov. The Red Cross and Southern Baptist Convention provide hot meals and send food and water to those without power after a heavy snowfall. Deaths: 6. Power outages: 53,000, down from 270,000. Other states with storm-related deaths: Pennsylvania (15), Maryland (4), New Hampshire (1), North Carolina (3), Ohio (2), Virginia (2).